A St. John’s County Sheriff’s Office K9 dog was killed in the line of duty early Tuesday morning, presumably drowned by a suspect. 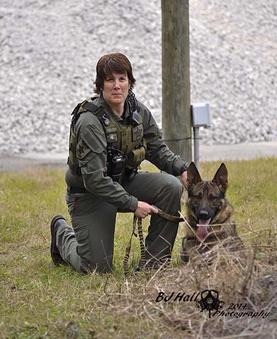 K9 Deputy Farrah Ashe and her partner Baron were in pursuit of Brandon Bernard Allison, who fled from a disturbance, when the dog team came to a fence. Dep. Ashe hoisted Baron over the obstacle and Baron continued without her while she scaled the fence. As Dep. Ashe tried to catch up with the dog, she heard shouting ahead in the darkness. Dep. Ashe found K9 Baron dead in the shallow water of a swampy area. Allison was gone and a manhunt ensued. Allison turned himself in late Wednesday. He was jailed on a felony warrant for Sale of Cocaine. 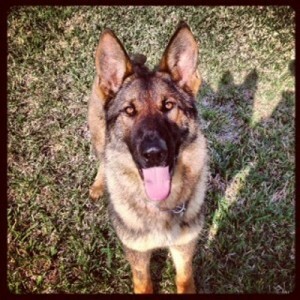 An investigation for felony Killing a Police Dog is underway. A necropsy will determine how K9 Baron was killed. K9 Baron was a two and a half year old German Shepherd dog who was acquired by SJCSO in 2013. He was Dep. Ashe’s second K9 partner. Baron was a dual purpose dog, trained for patrol and explosives detection. Dep. Ashe has served with the Sheriff’s Office since 1997. Chasing criminals is a dangerous business. K9 teams often work alone because of the possibility of contamination and distraction when taking other officers along during tracks. This leaves man (or woman) and dog to rely on each other if the fight comes. In eight years, I had many K9 tracks where, after a fair warning, my dogs were sent to apprehend a bad guy as I sprinted to join the battle. In one incident I lost my dog for about 20 minutes while I frantically trailed both the suspects and my dog by their footprints in the dewy grass. Fortunately, I found the dog and two perps went to County Jail. Sadly, I have attended two funerals for K9 dogs who were drowned in the line of duty by suspects. The somber services reminded me that even the toughest of police dogs are not invincible. The St. John’s County Sheriff’s Office will announce funeral details for K9 Baron. We extend our condolences to Dep. Ashe and the SJCSO K9 Unit. Photos: SJCSO and BJ Hall Photography. This entry was posted in K9, Street. Bookmark the permalink.